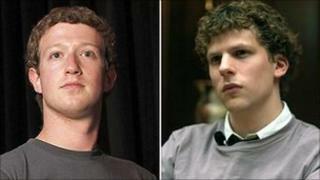 The Social Network, about the origins of the Facebook website, has been named best picture of 2010 by the Los Angeles Film Critics Association. The film's director, David Fincher, shared the directing prize with Olivier Assayas, whose biopic Carlos was voted best foreign language film. Colin Firth was named best actor for The King's Speech, in which the British star plays the stammering George VI. Winners will be honoured at a ceremony in Los Angeles on 15 January. The Social Network won an additional prize for Aaron Sorkin's screenplay and shared the best score award with Roman Polanski's The Ghost Writer. The movie, which stars Jesse Eisenberg and Justin Timberlake, has also been named best film prize at the New York Film Critics Circle. Fincher, has again been named best director at the awards, which were announced on Monday. The best actress prize went to Kim Hye-ja for South Korean drama Mother, while Toy Story 3 was named the year's best animated movie. The Social Network and Firth have also honoured by the Richard Attenborough Film Awards, presented annually by the UK's regional movie critics. Inception director Christopher Nolan was named film-maker of the year, while Sir Michael Caine was crowned an "all time legend". The nominations for next year's Critics' Choice Movie awards - presented annually by the Broadcast Film Critics Association - will be announced later.